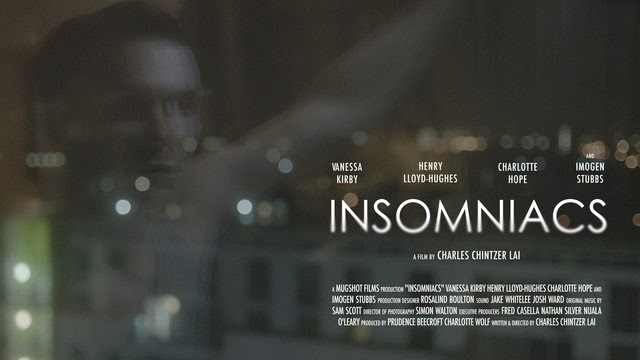 Charles Chintzer Lai (a name you will be familiar with if you happened to read The Totality's interview with him earlier this month) follows up his sharp and poignant short film Blue Monday with his latest impressively pitched work Insomniacs. Much like in Blue Monday, Lai's most recent short details, with concise melancholy, the romantic complexities of detached young adults. Whilst the world is sleeping, Insomniacs' protagonists find themselves bonded by their shared detachment from the ghost-world that exists in the dusk beneath them, observing, from on high, colours gradually returning to the world; daylight returns over and over, mocking the sleepless duo's inability to find rest. A dream-like moroseness keeps the two bonded and captive simultaneously. Theo (Henry Lloyd-Hughes) watches Jade (Vanessa Kirby) from a distance under the cover of the blanket of night - she, he surmises, is a kindred soul, a fellow sufferer of sleeplessness. Restlessness is at the heart of Insomniacs, captured with perceptive expressionism, and, as demonstrated in Blue Monday, Lai has a knack for surrounding himself with talented cast and crew, once again inspiring naturalistic and subtle performances from his actors. A clip of the film, and some words from the movie's director, are available over at NoBudge.